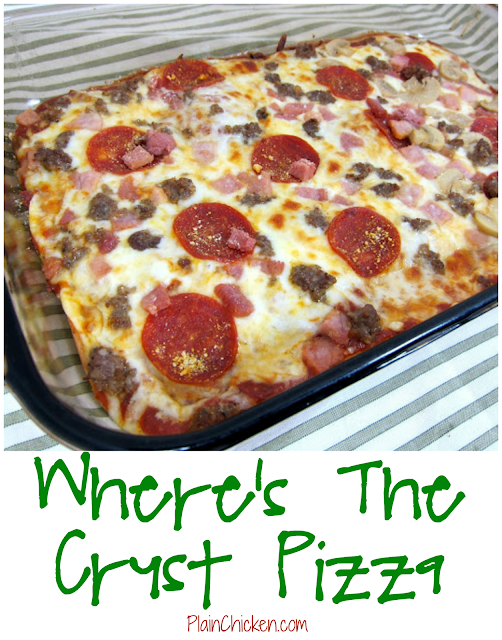 Where's The Crust Pizza - pizza crust made with cream cheese, eggs, garlic and parmesan cheese - no gluten! Top with favorite sauce and toppings. SOOOO good! We love to make this for our weekly pizza night! This pizza is low-carb and gluten free. For me, that usually translates into no taste, but this was really good! The "crust" is made with cream cheese, eggs and parmesan cheese. It doesn't sound like it would work, but it does. You can make the crust ahead of time if you are pressed for time. It can be stored in the refrigerator or in the freezer. We were really surprised at how good this pizza was. We both really enjoyed it, and actually didn't miss the traditional crust. It is definitely going in the rotation for pizza night. Preheat oven to 350ºF. Lightly spay a 9×13 baking dish with cooking spray. With a handheld mixer, mix cream cheese, eggs, pepper, garlic powder and parmesan cheese until combined. Spread into baking dish. Bake for 12-15 minutes, our until golden brown. Allow crust to cool for 10 minutes. Oh my I think I need to go eat breakfast. I just spent two minutes licking my lips over this one!! Do you think this would work using a pizza stone? Or should we stick to the 9x13? I added additional spices which I can only assume helped soaked up some of the liquid. Mine wasn't so funny that it had to be pooured into a dish. My dad is allergic to gluten, so I will have to try this for him. I am sure he will love it! YEA!!! This is exactly the kind of recipes I've been searching for. I'm trying to do the sugarless for life, which means no flour, cornmeal, white potatos and white rice. I'm going to try this very soon. I am definitely bookmarking this one! My MIL has celiac so she'd love this pizza! Tried this tonight! It was excellent except that id hoped for a crisper "crust." Amazing flavor in the no-crust crust, reminded me of lasagna. Im sure you all will enjoy this!! I used sausage and made my own pizza sauce. You should check out "Lynn's Kitchen Adventures", she has an awesome zucchini pizza. I, too am excited to try this recipe. It looks amazing! Quick question: would this also work with the light or reduced fat cream cheese, or is the fat needed to form the "crust?" I haven't tried this with light or fat free cream cheese. I would stay away from fat free cream cheese. I think you need some fat in order for the crust to bake up properly. For the "crust" is that grated parm in the green can? Jennelle - yes, I used the grated parmesan in the green can. I really easnt sure which yo use so I freshly grsted some and added a little bit from the pkg. The crust is cooling now. My mouth is waiting and its not easy! Yummmmm! This was absolutely delicious. I made this for my family tonight and everyone LOVED it. I would much rather have used a larger pan for a thinner "crust", but no complaints otherwise. We didn't even miss the deep dish crust we get at the national pizza chains. Thank you for this. We're trying to live s healthier lifestyle and recipes like this are a big help! That is twisted! You would never think it would work, would you? It does and it is yummy! Just finished eating some and it is wonderful and low carb. This pizza was very good! I have to admit I was doubting it but this is delicious and allows me to be healthier! Thanks for another great recipe! I've been meaning to try this variation. I'm gluten free and always looking for something new that tastes better than what's available frozen or off the shelves, which I hate to buy. Not all cream cheese is Gluten Free, but Philly I know is. Made this tonight and it was DELISH!! I live in Africa as a missionary, and didn't have cream cheese available to make it. I substituted Laughing Cow cheese (which can be found in the states too). Even though it is much lower in fat, it turned out perfectly! Thanks for a great recipe! Thank you for what you do! Our Wonderful Lord will greatly bless you! I used parmesan cheese grated off of a block with my microplane--could that possibly have made the difference? LL- yes, I had the same trouble. It was very "eggy". I thought it was because I didn't have room temp cream cheese so I microwaved it a bit and it got a bit too soft. Even if I was sure that is what the problem was, I wouldn't make it again. Sara & LL - did you use full fat cream cheese? That could make a difference. I used a hand mixer to make sure the cream cheese mixture was really mixed up well. That could also make a difference. Someone suggested baking the crust then putting it in the fridge to get the sufficient hardness. Then put on the toppings and re-oven. Great diabetic option! Especially for those who are trying to avoid being a slave to the needle. My daughter is on the Ketogenic diet and I think she will love love love this!!!! I can not wait to try this out of her!!!!! Thank you thank you thank you! Just made this tonight and it is really good. When I compare it to the cauliflower pizza crust this one wins hands down!! I have an OLD oven so I had to bake it longer but it was tasty. I can't have gluten or yeast or sugar so this one's a keeper!! I might try to use it as a base for other dishes, too! I'm going to have to try this! Ya know, another person commented that the taste reminded them of lasagna. You know when you're low carbing it and dying for lasagna? Do you suppose this could be rolled out thin and used for lasagna "noodles'"? Maybe if the dried a bit or were put in a low temp oven? I'm gonna have to play around with this when I'm at that phase if my diet where I can add this stuff again. Thanks for the recipe! Made this for dinner and it was amazing. WOW Cannot wait to try this too! Was sooooooooooooooooooooooooo glad I saw this today too! Thank you! I just made this with low fat cream cheese it was awesome! I left the "crust" in the oven for about 19mins and let it cool for about 20mins. Other than that I followed it exactly. Even my 4 year old loved it. Loved the pizza and so easy to make. Here's my question - What's the serving size? 1 square? 2? This is a wheat free recipe - it is not a healthy meal, nor would it promote weight loss. But it certainly looks like a good idea for those who are gluten intolerant and crave pizza occasionally. Actually this is a healthy meal. You are under the assumption that a diet high in saturated fat causes heart disease. The research now says that a diet high in refined carbohydrates/sugar is the culprit not the fat. Yes, it would promote weight loss.a diet high in fat, moderate in protein, and low in carbs lowers the insulin response. Insulin drives fat storage. So yes it is healthy. Thank you for sharing this recipe-I made this pizza last night and it's delicious! I really couldn't wrap my mind around an egg and cream cheese based crust-but I followed the advice of another comment and baked it a little longer. Today the leftover refrigerated pizza is even tastier, and the crust is even more like "bread". Yum!! Will make again for sure! It was delicious! I used 1/3 less fat CC and baked it longer just like someone above mentioned. I also used weight watcher cheese. 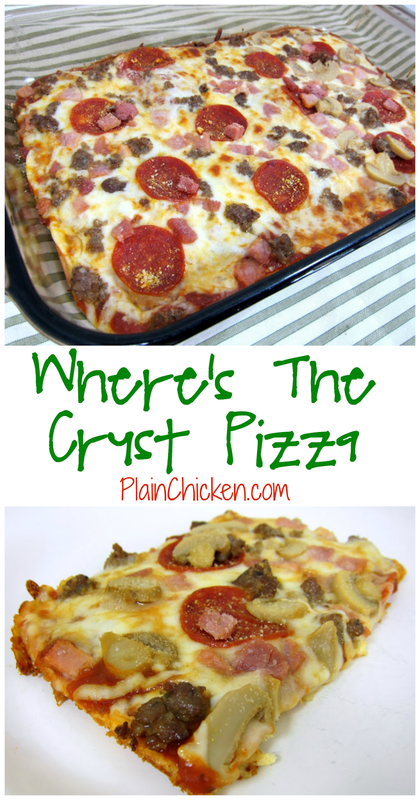 Thank you for this great recipe...my family loves it and doesn't even miss the normal crust! Love this recipe. I used a 11x14 pan, cooked the crust 20 minutes, and we thought it was awesome! This is wheat free but not all ham, sausage and pepperoni is gluten free. I tweaked this a bit. I used half the ingredients and spread it into a 10X6 rectangle on a cooking sheet. After it had chilled, I flipped it and placed the toppings on the browned side so the other side could cook some more. It was sorta "pizza-like" but I thought it was too wet to really have a bread mouthfeel. It's a decent option for a low-carb wheat-free pizza....but it's definitely not great. My daughter had gastric bypass surgery and can't have grains. She makes this at least once a week, varying the toppings. She has also discovered that after the crust has rested the first 10 minutes, if you cut it into rectangles, sprinkle with parmesan and other cheeses then bake as usual, you have some pretty delcious cheesy 'breadsticks'. Thanks for the recipe! Made this tonight turned out awesome! Had to make two pans because they loved it so much!! Oh wow! Hubby and I are low carbing and it really felt like we were cheating on the diet. Thank you for this recipe! I just made this, and it tastes delicious, like pizza! Next time I try putting it in a larger pan, like another suggested, and definitely cook until it is golden brown. Thank you for posting this recipe! Who knew that cream cheese and a few eggs would made a great pizza crust. I was just wondering if you knew how many carbs would be in this? You could make your own low carb pizza sauce. You can easily google one. The crust has no carbs. I make a low carb sauce that has 4g net carbs. Made with Neufchatel cream cheese worked just fine. Oven quit working so I microwaved it. It came out really good, Just one soft spot. I cut up the crust and put it in the fridge, then put on toppings on for lunch and dinner (taco Pizza) and nuked awesome. Just kept nuking it till It looked done, couple min at a time. Actually Jeanne, this recipe will promote weight loss, when used on a low carb diet. Do a bit of research before you throw inaccurate info out there. Fat is not unhealthy - grains are. This is a wheat free recipe - it is not a healthy meal, nor would it promote weight loss. But it certainly looks like a good idea for those who are gluten intolerant and crave pizza occasionally." You are absolutely right Candace. On a low carbohydrate diet that is high in fat you are actually decreasing your risk for heart disease, type 2 diabetes, and Alzheimer's! And the body is able to burn its own fat to decrease body fat percentage. Check out the book Good Calories Bad Calories by Gary Taubes and "Grain Brain" by neurologist Dr. Pearlmutter. I'm eating this as I type. Very good. I made it as directed. Perfect for anyone on low carb, or avoiding gluten. Good job, Steph! My husband and I make this too and we are devoted fans! It's amazing, I don't miss the crust at all. I made this and it came out good. The crust was soft, so I am putting it in the fridge tonight and re-heating tomorrow. Should come out nice and crispy. I am on WW so I was afraid to see how many points it would be. If prepared by instructions using all regular, not fat-free products, divide 9x13 baker into six servings points are only 7 per serving. YAY! Happy Dance. This looks so very good, I love pizza!. Made this tonight. Super good. Had a sort of lasagna flair. Will definitely make again! Thx! @Jeanne, you have found yourself among people who have learned that the key to weight management without hunger is low carb diets! So most of us agree that since this meal avoids carbs, it is a healthier option. Adding a salad or veggie toppings could make it healthier, but skipping the wheat crust is a good start! I am on a gluten fast and look forward to making this. I don't have a hand mixer - just a standard KitchenAid. Would it work to use that? Would I want to use the wisk attachment? Thank you! I just mixed my crust ingredients in my nutribullet (I'm sure a blender would work the same).Ive made it twice now and both times it game out great!! I made this today also on a gluten free diet..I used soy and gluten free galic and jalopeno cheese. Organic mushroom baby spinach, and greenpepper! Now that was some good pizza! Will definitely make this again!! Holly - so glad you liked it! Thank you Julie!! It is being used without permission. I reported it to Facebook. Do you think I could cut this in half and make it in a 9x9 pan? I only want to make a meal for 2. Also, what would make a good side dish to go with it? A 9x9 pan should work fine if you half the recipe. I usually serve salad with pizza. You could also do asparagus. Tried it tonight. Was pretty good. I was going to take the crust out of the pan and put it on a pizza tray, but it wouldn't come out cleanly. I think I'll try again next time. Very tasty alternative for pizza. What could I use to replace eggs, my daughter is allergic to them? In the oven as we speak. I'm sure it will be tasty. Any idea whether this crust can be frozen after baked? Is this crust crunchy? I made a cauliflower crust and did not like the texture of it, so I was hoping this is a little more like real crust. Thanks! It’s soft, but it has really great flavor! So excited about this recipe! I am trying to cut out wheat and I miss a good pizza! Thank you for sharing. I'm super excited to try this! I've lost over 22 lbs. on the Metabolism Miracle diet and I must say, pizza is one of the things I miss the most. Usually I just eat the toppings off the crust, so this will be great to try and add to my meal rotation! Thanks again! This recipe was a hit in my home. My son says he likes this pizza better than "regular" pizza. Last time, I made 2 "crusts". One, I made 1/2 a chicken/bacon/ranch with fresh tomatoes; 1/2 Hawaiian with bbq sauce, pineapple, chicken and bacon. The other crust, I made a basic sausage & pepperoni, but on one half, I added mushrooms and pineapple. I topped with mozzarella and a bit of cheddar. I'll bet you could turn this base (without the garlic) into a delicious dessert, like a fruit pizza or a baked fruit topped dessert, the possibilities are endless. I made this tonight, and it was really tasty! The "crust" was definitely not crust, however. Too soggy, too wimpy, the only way to pick it up was to hold it on the palm of our hands so the entire piece was supported. I was going to bake it longer, but it wasn't browning but rather burning in spots so I pulled it out at about 20 minutes. I'll be making it again, but with some tweaking using some of the suggestions given in the comments. What kind of pizza sauce are you using>? how long do you leave the cream cheese out to be room temperature? Is this something you could make in a mu tin and then freeze and put in the overn later when you are ready to eat it? This was so good!I only made a half batch, but it now I know how good it is.I will make this often. Just wish I could do pineapple! When I make this, I will line the 9x13 pan with parchment so I can remove it after baking and flip it over so the bottom can brown when I bake the pizza on a pizza stone. Could you swap out the Parmesan for cheddar cheese? You could certainly give that a try. I haven’t made it that way, so I don’t know how it turns out. Made this tonight; it is delicious. Would like to get the crust crispier, though; any tips? AMAZE BALLS! AWESOME, DELICIOUSNESS! THANK YOU! KETO FRIENDLY. nutritional values, how many carbs, & what is a serving size? Depends on what you put on it! Mom found this recipe on Facebook but without a link, so I'm glad I found the original. I've been on the Ketogenic way of eating and this is less work than the chicken crust pizza I usually make. Bookmarking and pinning. I made the crustless pizza and it was a huge hit. The first time I made it, I used the 9 x 13 casserole dish. I thought it was to floppy and thin. I made it again and used a 10 x 9 casserole dish. Just the right thickness. I also used low-fat cream cheese instead of the full fat. My toppings were mushroom, and Portuguese sausage (chourico). To reheat it, I use the toaster oven and put it directly on the racks to crisp the bottom a little. My whole office smelled delicious, my coworkers did not believe it was a crustless pizza. The recipe has been shared....Thank you for the great recipes, looking forward to making the lasagna next week. I think this would be fun with toppings like sausage and bacon to make a breakfast version! This is a great recipe. My non keto eating husband liked it too. Awesome recipe. Even my non keto husband liked it. Does it have a strong cream cheese taste? I do not like cream cheese? I don't have a handheld mixer... will that ruin the recipe at all? What is the serving size and how many servings does this recipe make?